Place the garlic cloves on a piece of aluminum foil. Fold the foil to enclose the garlic and place the ‘packet’ in the oven for approximately one hour. This will roast and soften the garlic. Wash the potatoes well in fresh water with a brush. When finished, place in a pot with plenty of water and add one tablespoon of salt. Cook over high heat and bring to a boil. Once the water boils, continue to cook them for 15 minutes. Remove from heat and drain the water. The potatoes should be soft. Let them cool to the side while preparing the rest of the ingredients. Cut the pancetta into small pieces and place in a frying pan without oil, over medium heat until golden and crunchy. Drain the pancetta pieces over a paper towel to remove any excess oil. Save one tablespoon of the frying pan drippings for later. In the same frying pan, sauté the onion over medium heat with the tablespoon of reserved pancetta drippings. Cook until the onions are transparent and then place over a paper towel to dry. Once the potatoes have cooled off, cut out a narrow, lengthwise section in the middle of each potato. Remove the pulp with a spoon leaving the shell of the potato intact. Place the potato pulp in a microwave-proof mixing bowl and heat for two to three minutes. Immediately add the pancetta, onion, roasted garlic cloves and butter. Mix the ingredients vigorously with the help of a fork or a wisk, then pour in the cream little by little until you obtain a silky puré. Incorporate the blue cheese and stir by ‘folding’ the mixture, then season with salt and pepper to taste. Fill each potato ‘shell’ with the warm puré, and garnish with pieces of pancetta and green onion. Serve immediately. If you can’t find pancetta in your market, you can substitute it for Canadian bacon or diced smoked ham. If you don’t want to boil the potatoes, after washing and drying them, they can be microwaved for approximately 8 minutes. When it comes to side dishes, I know just the right recipes to delight your guests; it’s a dish that will leave you satisfied and your guests asking for more! 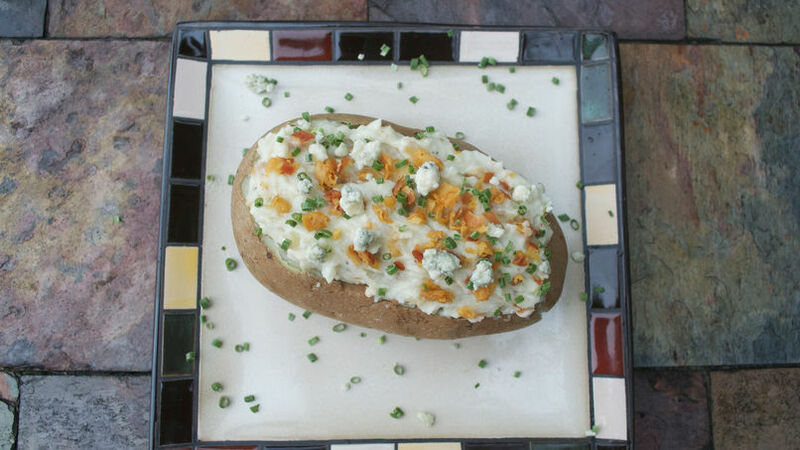 This recipe for preparing baked potatoes stuffed with pancetta and blue cheese is foolproof. My family has been charmed too; it’s easy to prepare and requires few ingredients. These stuffed potatoes are the perfect complement to you meat, chicken, fish or pork main courses. Potatoes are very versatile and varied; you can use them to create a wide array of recipes: French fries, baked or steamed potatoes, salads, soups, mashed potatoes, etc… It’s always delicious!